Hosseininezhad, S., Jabalameli, M. (2016). A multiobjective continuous covering location model. Journal of Industrial and Systems Engineering, 9(special issue on location allocation and hub modeling), 40-52. Seyed Javad Hosseininezhad; mohammad Saeed Jabalameli. "A multiobjective continuous covering location model". 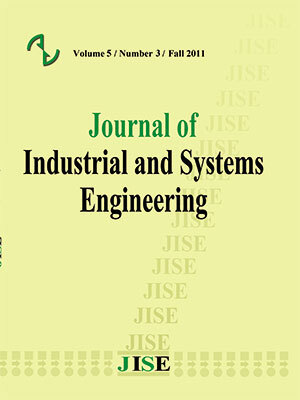 Journal of Industrial and Systems Engineering, 9, special issue on location allocation and hub modeling, 2016, 40-52. Hosseininezhad, S., Jabalameli, M. (2016). 'A multiobjective continuous covering location model', Journal of Industrial and Systems Engineering, 9(special issue on location allocation and hub modeling), pp. 40-52. Hosseininezhad, S., Jabalameli, M. A multiobjective continuous covering location model. Journal of Industrial and Systems Engineering, 2016; 9(special issue on location allocation and hub modeling): 40-52. This paper presents a multiobjective continuous covering location problem in fuzzy environment. Because of uncertain covering radius, possibility of covering concept is introduced.Since, the uncertainty may cause risk of uncovering customers; the problemis formulated as a risk management model. The presented model is an extension of the discrete covering location models tocontinuous space. Two variables, namely, selecting zone variable and covering variableare introduced for extending the discrete model to the continuous one. In the model, a facility is locatedin a zone with a predetermined radius from its center and is determined by the selecting zonevariable. Allocating a customer to a facility is shown by the covering variable. Also, the paperintroduces the possibility of covering based on distance between the customers and the facilities. Two objectives are considered in the model; the first is the possibility of covering by each facility and the second is the risk cost of the uncovered customers.Then, a fuzzy programming is applied for converting the model to a single objective one. Finally, a numerical examplewith sensitivity analysis is expressed to illustrate the presented model. Araz C., Selim H., Ozkarahan I., (2007), “A fuzzy multi-objective covering-based vehicle location model for emergency services”, Computers & Operations Research, 34, 705–726. Azaron A. et al., (2008), “A multi-objective stochastic programming approach for supply chain design considering risk”, International Journal of Production Economics, 116, 129-138. Batanovic V., PetrovicD., PetrovicR. (2009), “Fuzzy logic based algorithms for maximum covering location problems”, Information Sciences, 179, 120–129. Berman O., Krass D., Drezner Z., (2003), The gradual covering decay location problem on a network, European Journal of Operational Research,151, 474–480. Chen Z., Li H., Ren H., Xu Q., Hong J., (2011), “A total environmental risk assessment model for international hub airports”, International Journal of Project Management , 29, 856–866. Chiang C. I. , Hwang M. J., Liu Y. H., (2004), “Solving a Fuzzy Set-Covering Problem”, Mathematical and Computer Modelling, 40, 861-865. Chiang C. I. , Hwang M. J., Liu Y. H., (2005), “An Alternative Formulation for Certain Fuzzy Set-Covering Problems”, Mathematical and Computer Modelling, 42 , 363-365. Church R, ReVelle C., (1974), “the maximal covering location problem”, Papers Region. Sci. Assoc., 32,101–118. Cui T., Ouyang Y., Shen Z.-J. M., (2010), ”Reliable facility location design under the risk of disruption”, Operation Research, 58, 998-1011. De Boer P., Kroese D.P., Mannor S, Rubinstein R.Y., (2005), “A tutorial on the cross-entropy method”,Annals of Operations Research, 2005,134(1):19–67. Drezner Z., Wesolowsky G., (1999), “Allocation of discrete demand with changing costs”, Computers and Operations Research, 26, 1335–1349. Francis, R.L., F. Leon, L.F. McGinnis, and J.A. White, (1992), “Facility Layout and Location: An Analytical Approach” ,NY: Prentice Hall. Guillen G., Mele F.D., Bagajewicz M. J., Espuna A., Puigjaner L., (2005), “Multiobjective supply chain design under uncertainty”, Chemical Enginnering Science, 60, 1535-1553. Hahn G.J., Kuhn H., (2012), “Value-based performance and risk management in supply chains: A robust optimization approach”, International Journal of Production Economics, 139, 135-144. Huang B., Liu N., Chandramouli M., (2006), “A GIS supported Ant algorithm for the linear feature covering problem with distance constraints”, Decision Support Systems, 42, 1063–1075. Hosseininezhad S. J.,Jabalameli M. S.,JalaliNaini S. G, (2013), “A continuous covering location model with risk consideration”, Applied Mathematical Modelling, 37, 9665-9676. Hosseininezhad S. J.,JabalameliM. S.,JalaliNaini S. G, (2014), “A fuzzy algorithm for continuous capacitated location allocationmodel with risk consideration”, Applied Mathematical Modelling, 38, 983–1000. Laporte G., Nickel N., Saldanha da Gama F.,Editors, (2015), Location Science, Springer, Switzerland. Liu K., Zhou Y., Zhang, Z. (2010), “Capacitated location model with online demand pooling in a multi-channel, supply chain”, European Journal of Operational Research, 207, 218–231. Lushu L., Kabadi S. N., Nair K.P.K. (2002), “Fuzzy versions of the covering circle problem”, European Journal of Operational Research, 137, 93-109. Mirchandani P.B., Francis R.L., (1990), Discrete location theory. Wiley, New York. Mete H. O., Zabinsky Z. B., (2010), “Stochastic optimization of medical supply location and distribution in disaster management”, International Journal of Production Economics, 126, 76-84. Nickel S., Saldanha-da-Gama F., ZieglerH.-P., (2012), “A multi-stage stochastic supply network design problem with financial decisions and risk management”, Omega, 40, 511–524. Owen S.H., Daskin M.S., (1998), “Strategic facility location: a review”, European Journal of Operational Research, 111, 423–447. Ozsen L., Coullard C. R., Daskin M. S., (2008), “Capacitated Warehouse Location Model with Risk Pooling”, Naval Research Logistics, 55, 295-312. Peng P., Snyder La. V., Lim A., Liu Z., (2011), “Reliable logistics networks design with facility disruptions”, Transportation Research Part B, 45, 1190–1211. Perez J.A.M., Vega J.M.M., Verdegay J.L., (2004), “Fuzzy location problems on networks”, Fuzzy Sets and Systems, 142, 393–405. Rubinstein R. Y., (1997), "Optimization of computer simulation models with rare events", European Journal of Operation Research, 99, 89-112. Schilling D., Jayaraman V., Barkhi R., (1993), “A review of covering problems in facility location”, Location Science, 1, 25–55. Shavandi H., Mahlooji H., (2006), “A fuzzy queuing location model with a genetic algorithm for congested systems”, Applied Mathematics and Computation, 181, 440–456. Synder L. V., Daskin M. S., Teo C.-P., (2007), “The stochastic location model with risk pooling”, European Journal of Operational Research, 179, 1221-1238. Toregas C., Swain R., ReVelle C., Bergman L., (1971),“The location of emergency service facilities”. Oper Res., 19, 1363–1373. Wagner M. R., Bhaduryb J., Penga S., (2009), “Risk management in uncapacitated facility location models with random demands”, Computers & Operations Research, 36, 1002-1011. Wang S., Watada J., (2012), “A hybrid modified PSO approach to VaR-based facility location problems with variable capacity in fuzzy random uncertainty”, Information Sciences, 192, 3-18. Yaodong N. (2008), “Fuzzy minimum weight edge covering problem”, Applied Mathematical Modelling, 32, 1327–1337. You F., Wassick J. M., Grossmann I. E., (2009), “Risk management for a global supply chain planning under uncertainty: models and algorithm”, AIChE Journal, 55, 931-946.